Standard-Knapp, a worldwide leader in the manufacture of innovative packaging machinery, will feature its flexible, reliable 298 Tritium Trayshink Packer at Pack Expo 2015, September 28-30 at the Las Vegas Convention Center in Las Vegas, Nevada. Standard-Knapp’s latest enhancements to this proven solution will be exhibited at Booth #C-4214. The 298 Tritium Trayshrink Packer offers both reliability and flexibility as a single machine capable of tray, pad and unsupported pack styles. This flexibility in use styles makes it ideal for co-packers who need to respond to customers’ needs. Adding to the 298 Tritium’s innovative nature is its high speed Robo-Wand wrapping module, capable of running up to 120 trays per minute and providing a consistent tight, wrinkle-free wrap. The Robo-Wand also offers multi-axis control for limitless packing possibilities without the need for change parts. To ensure that the tray blank magazine doesn’t run out too quickly at this fast rate, Standard-Knapp offers a standard magazine capable of holding 1500 blanks, with an optional 3000-blank extended capacity. The 298 Tritium Trayshink Packer’s horizontally loaded tray blank magazine is ergonomically designed for operator comfort and simplified maintenance. Operators can load blanks without bending or stretching, and can quickly spot any operational issues. In addition, changing from one pack style to another is easy. It only takes operators about 15 minutes to change over pack styles by selecting a new product on the operator interface screen and a changing over a small number of parts. Standard-Knapp’s packaging solutions satisfy the market’s ever increasing desire for ease-of-use, consistent performance, speed and reliability. Whether in the food, beverage, or personal care industry, Standard-Knapp’s innovative solutions and dedicated customer service will provide robust, reliable packaging machinery designed for 24/7 production and built to last for decades. Standard-Knapp is the leading manufacturer of innovative packaging machinery for a variety of industries including beverage, food, household chemicals, personal care, and automotive. 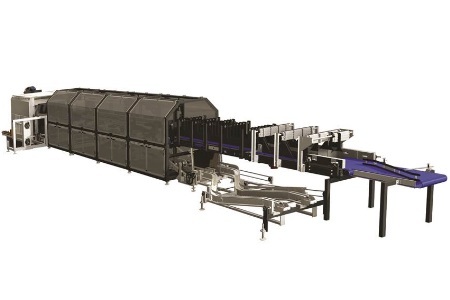 A pioneer in the field of automatic packaging equipment, Standard-Knapp provides robust, efficient packaging solutions such as tray packers, case packers, shrink wrappers, multipackers, uncasers, sliiter/sealers and stand-alone sealers.